The boiling of the grape must takes place in open boilers with direct heat. Once they were made of copper, today the used one are of stainless steel. Some years ago, the boiler full of must was heated thanks to firewood; today this process happens with a gas burner or with a thermostat that ensures a constant temperature maintenance by avoiding the classic changes due to the firewood. 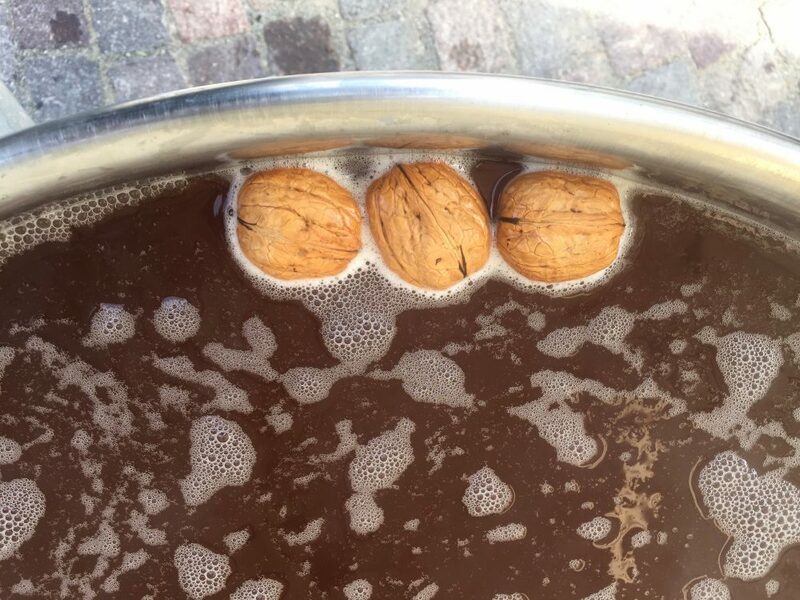 Previously walnuts were added to the boiling grape must to monitor its temperature, in fact if the temperature is too high, the walnut starts to turn. Today, some vinegar producers still add walnuts during cooking to keep tradition alive, although they keep using the thermometer. The boiling of grape must process begins by filling the boiler with the must and trying to bring it to a temperature of about 90/95 degrees in a fairly short time with lively fire, to avoid the alcoholic fermentation. Once the temperature has been reached it will be maintained with moderate flame. During cooking, the effect that is obtained is the evaporation of part of the water present in the must and the increase of the sugar, moreover the impurities will emerge thanks to the heat and this will make easier their removal. The boiling of grape must usually starts in the morning and ends when it is now evening or even in the case of six quintal boilers, even until the next morning. Cooking will end when the must is cooked and it is reduced to about half the initial volume. There are two possible opposing cases: a reduction of only one third of the initial product or a reduction of up to one third of the initial volume. The point at which to stop, between these two extremes, depends on the gradation of the fresh must used at the beginning of the process and on the different needs of the various vinegar yards and on the different use that the producer wants to make of the grape must. During cooking it is essential to avoid that the must never reaches full boiling, thus avoiding that the product burns; the optimal temperature is 90/95, these degrees ensure a moderate caramelisation of the sugars that gives the typical taste to the must used for Traditional Balsamic Vinegar of Modena. Once the cooked must has cooled down, it must be stored in carboys filled to its maximum and hermetically sealed for the necessary winter settling. Carboys should then be placed in a cold and dry place to avoid the development of mould and ensure the decantation of the product, during this phase the cold that will kill bacteria. In spring the cooked must is purified, ready to begin the balsamic fermentation phase and use Balsamic Vinegar that is going to be created. * The value read on the densimeter refers to the so called “Babo” degree, where each degree corresponds to 10 grams of sugar in 1000 grams of must. Previous Ravioli with asparagus and Balsamic Vinegar! Rocca Rangoni: the Balsamic Vinegar residence!